For power ICs, the thermal parameters of different packages should be compliant with different applications and user’s requirements, as well as determining the thermal limits of different types of packages for the spec. Thermal parameters, such as thermal resistance θJA and θJC, are applied to determine thermal dissipation performance for integrated circuits. A low thermal resistance represents better thermal performance. A system that has a lower thermal resistance can dissipate more heat. This article illustrates the thermal dissipation of integrated circuits with SOT-223 package, including thermal parameters and the internal structure. Finally, we will introduce the thermal analysis of PCB copper layout for SOT-223 package. The thermal resistance is a heat property of a temperature difference by an object, which is the reciprocal of thermal conductance. In the heat flow path of specific package, there exists many heat resistance, major relating with the materials of the silicon chip, molding compound, copper of lead-frame, die attachment, and so on. In Figure 1, it is a equivalent thermal resistance model of a specific package. For which, the series of resistance is defined as Eq.(1). The key thermal parameter for ICs is junction temperature (TJ), which also determines stability of IC. 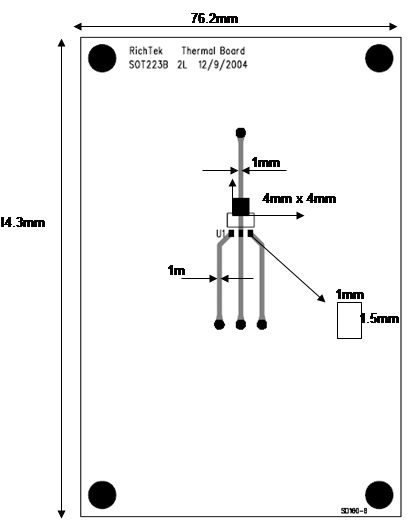 Generally speaking, the IC datasheet will present the recommended operation temperature of junction. Since TJ cannot be measured directly, the Eq. (2) and Eq. (3) can be used for approach. In JEDEC 51 standard, the case temperature (TC) is defined at “hottest” position of the package surface and ambient temperature (TA) is defined for test environment temperature. Following JEDEC 51-2 thermal measurement standard, θJA should be measured by standardized environmental condition in the natural convection (air flow = 0 ft/min) at TA = 25°C. The standardized environmental condition is presented as Figure 2 (Dimensions in mm.). 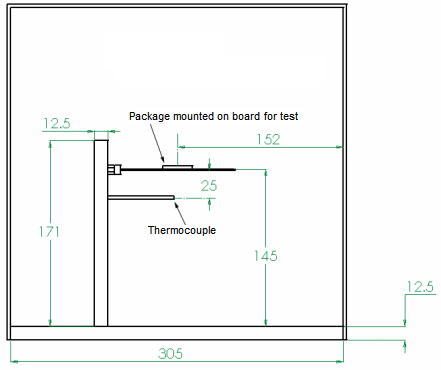 In JEDEC 51-3 and JEDEC 51-7 thermal measurement standard, the device under test is mounted on standard test boards, the detailed specifications of test board are presented as Figure 3 to Figure 6. For SOT-223 package, a 4mm x 4mm copper area and 1/mm width copper wire is designed to dissipate the thermal flow. Base on Eq. (2), the lower resistance means that the junction temperature will be lower in the same power dissipation and ambient temperature, and the thermal conductivity of package material will dominate the thermal resistance of package. Therefore, the SOT-223 package utilizes high thermal conductance of lead frame to decrease the thermal resistance. The SOT-223 package internal structure is shown in Figure 7, and the physical dimension parameters and material properties of the components used in this model are summarized in Table 1. In Figure 8, it is very specificaly difference of structure between SOT-223 and other packages. In SOT-223 package, the die, thermal soure, is directly connected to exposed lead frame, and the major thermal flow can be conducted through the exposed lead frame to PCB trace and ambient. 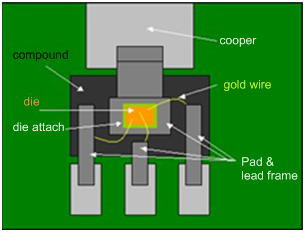 However, other packages only use gold wires to connect the die and the lead frame. That makes thermal resistance of SOT-223 smaller than other packages. As a result, we can use this characteristic to improve the thermal performance by designing the PCB copper layout on SOT-223 package. Beacuse of the structure of SOT-223 package, the thermal resistance can be improved by adding copper area under the exposed lead frame. 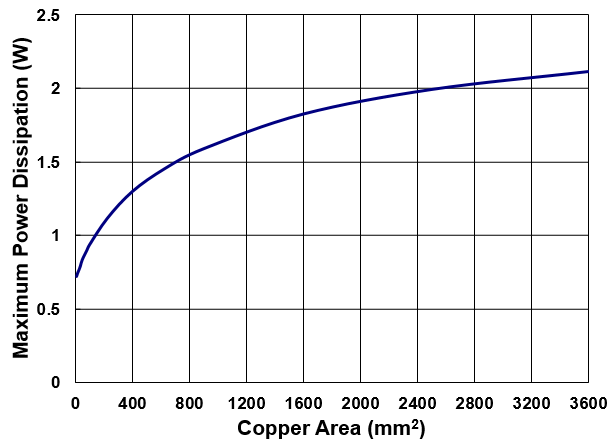 Figure 9 shows the relationship between the copper area and the thermal resistance θJA. When IC is mounted to the standard footprint (16mm2), the thermal resistance θJA is 135°C/W, adding copper area of pad to 100mm2 under the package reduces the θJA to 107°C/W. 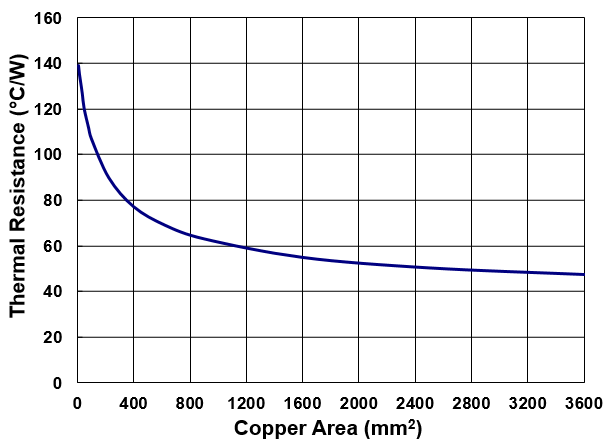 Even further, increasing the copper area of pad to 2500mm2 reduces the θJA to 50°C/W. 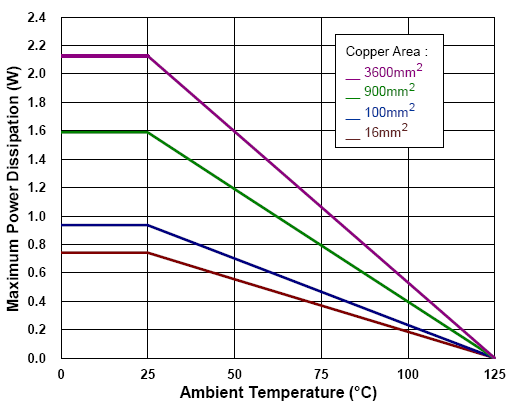 As shown in Figure 9, we can also find the SOT-223 maximum power dissipation improvement by different copper area design at ambient temperature TA = 25°C operation. For the SOT-223 packages, the de-rating curves in Figure 11 allow the designer to see the effect of rising ambient temperature on the maximum power dissipation. According to the above discussion of thermal resistance and junction temperature, it was found that the thermal resistance affects dissipative heat of the system. We must follow the maximum power dissipation (power limit) and maximum junction to ambient thermal resistance requirements. If the selected package can’t satisfy the requirement of thermal resistance restrictions, PCB layout needs to be improved to keep IC junction temperature below 125°C. Hence, for high power IC series products with a variety of power dissipations, adding proper copper area is essential. This article provides a general thermal concept for SOT-223 package. Many estimations and generalizations have been used. Please refer to these information as a generally approximation of required board copper area. 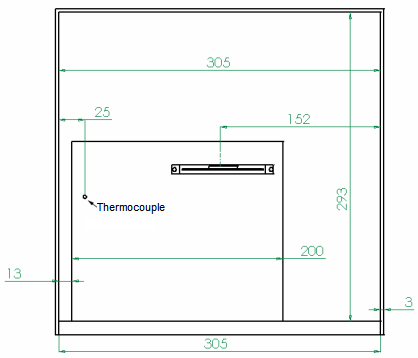 If customers need further thermal information on any system level design, please contact us.